We know you’ve heard the bad news: print journalism is dying. But who, WHO, will tell Clark Kent that The Daily Planet is being downsized and he’s being moved to the online news outlet? Sounds like a job for Superman! So what will Clark’s new position look like at The Daily Planet Multimedia Inc.? He’ll arrive to work via a self-driving car and he’ll immediately stop by one of the on-campus coffee bars, get caffeinated, then hit the open concept office until lunch. Now, he performs all his interviews via webcam, so he will need help to find a way out of the office and into the streets to fight crime again. Here is where you come in: put on this Adult Superman Clark Kent Costume and you can be on call to help out your favorite superhero when he desperately needs you. 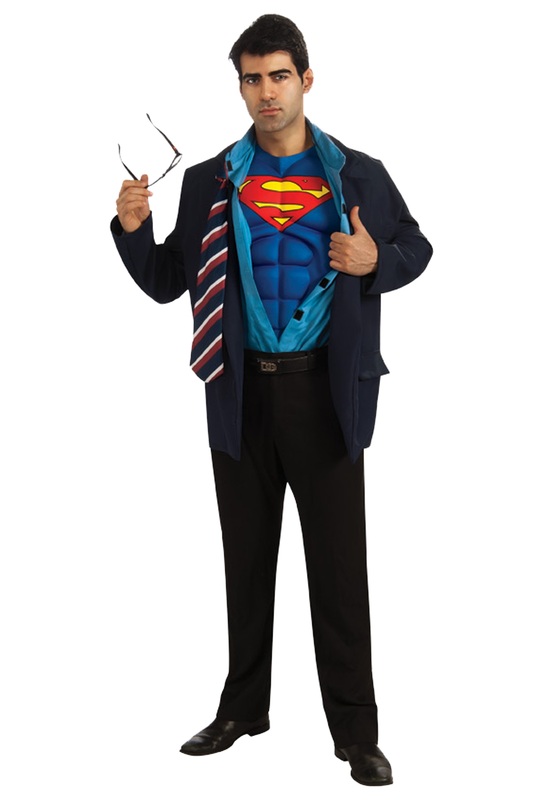 At the drop of a hat, you can rush into a phone booth (there must still be one or two around…as retro decoration…somewhere…), slip on this costume, and go and take Clark’s place at the office, so he can get out of the planning meeting about “How to Grab Millennials’ Attention Through Interactive Newscasts” and back to fighting crime on the mean streets, where he belongs. No one will recognize you in the Navy blue jacket with reveals your secret identity via Superman muscle chest piece, below. The black glasses finish off your ensemble that is sure to psych out everyone at Who knows, if you play the part well enough, Superman may even decide he needs a doppelganger out in the field. Just don’t try to pull one over on Lois Lane—she’s the new head of Search Engine Optimization, and she’ll be onto you.